Imagine no more emailing photos to yourself, hunting for a USB cable, or running out of room on your USB OTG compatible Android phone or tablet. Flash Voyager GO is the quick and easy way to move photos, music, and videos between your mobile devices and your PCs and dramatically increase your devices’ storage. Have you ever snapped a photo, and then emailed it to yourself so you’d have a copy on your PC? Have you ever backed up your photos and videos to a low-resolution site like Facebook or Instagram, and then deleted them to save room? Or, do you simply like taking photos and videos more than you like to manage your photo collection? Flash Voyager GO is here to help. Any time you want to share some media or clear room on your Android phone or tablet, just attach the Flash Voyager GO, select and copy the images and videos you’d like to save, and then copy them to your desktop or notebook PC at your leisure. You don’t need to be at your PC or hunt for a USB cable. 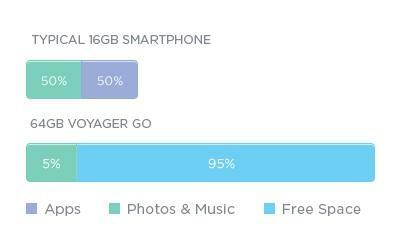 And unlike cloud storage, Flash Voyager GO lets you keep control of your media, and there’s never a monthly fee. The typical smartphone or tablet has 8GB or 16GB of memory. That might seem like a lot at first, but once you add apps, odds are that it just doesn’t have enough room for all the music, photos, and videos in your collection. And, upgrading your device’s memory card – or worse yet, replacing it with a higher-capacity model – can be an expensive proposition. With Flash Voyager GO, just attach it to your PC, copy your collection, and then snap it in to the Micro-USB port on your mobile device any time you want. At only 37 mm total length, you’ll want to take it everywhere.